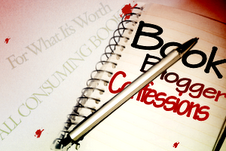 Book Blogger Confessions is new meme, hosted twice a month by All-Consuming Books and For What It's Worth. You can learn more about it by clicking here. Spoilers in reviews: Do you read them, do you include them? How do you describe (or avoid describing) spoilery parts of a book? I hate spoilers. There, I've said it. If I see reviews go up for a book in a series that I absolutely love, I'll avoid them like the plague until I've read the book in question. If someone posts spoilers on Goodreads or Twitter, I will unfollow them if they make it a habit. When I write reviews, I do my best to not add spoilers and when I'm writing a review for a book in a series (that is not the first book), the first sentence or two of my review is always a warning to people who haven't read the first book--telling them that there will inevitably be some spoilers for them in my review of the second (or third, etc.) book and that if they don't want any spoilers, they should go read the previous books in the series first. If I do--accidentally--give spoilers, then I do my best to make sure that they're very, very minor. And when it comes to avoiding writing spoilers into my reviews, I can be incredibly vague--and usually I feel terrible because of it, but at the same time, if you read the book, you'll still now exactly what I'm talking about. There are times that I might have strong feelings about something that is a spoiler for a book and usually I'm either incredibly vague or I avoid mentioning it--admittedly I'm more likely to be incredibly vague than completely skip over something that I feel that strongly about. I hate being vague but that's what I do too and just hope my feelings come across in the review. I never want to ruin a book for anyone. I hate being vague too. Its tough with books that you love or hate. I think it's great that you include a warning before your reviews if you know there will inevitably be spoilers. If I knowingly read a spoilery review for whatever reason, that's one thing. But if I read a review with no warning whatsoever and get smacked in the face with a huge spoiler, I get pretty upset, and I know many others do as well. I, like you, tend to avoid reviews of sequels and such for fear of spoilage, but sometimes it can't be helped and it's nice to have some forewarning. I try my best to avoid spoilers but have included them on occasion (if reviewing a sequel or something). But I do make sure that they are clearly marked so that people can avoid them if they don't want the book spoiled.